Rather than hijack Petes thread and figuring this might have wider interest I started a new thread. Having pulled my drill stand to bits and pressed the gear out, how to go about 3D modelling it and see if it can be improved for 3D printing. The straight cut teeth have very little radius at the root so can see how you could shear a tooth quite easily. Whilst looking at my gear I also noticed the witness mark from the return spring and that it was slowly ripping the boss apart when under load. 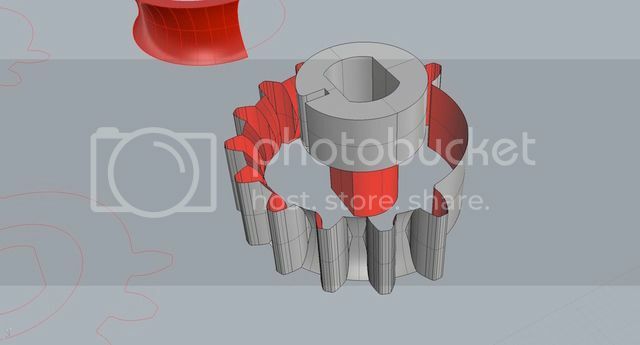 For me doing something like this and being unsure of the gear tooth profile, since it doesn't seem critical I take a picture and import into my CAD package. 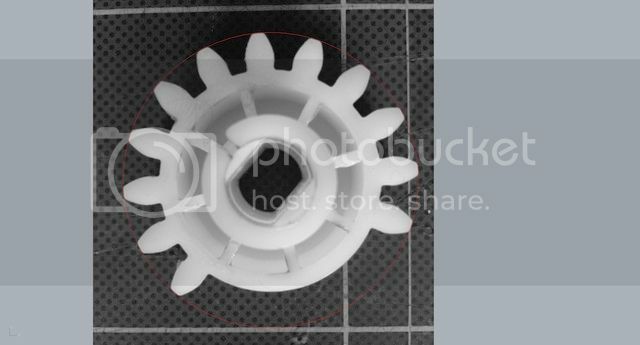 Measure the gear and get some reference dimensions, the red outer diameter circle, then scale the gear to as near a fit as you can. Next job is to approximate the tooth profile. 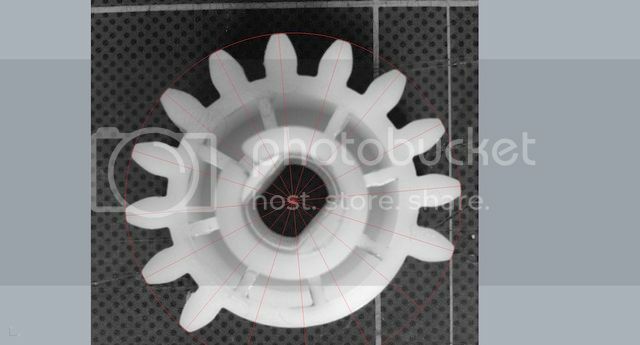 Confirm the tooth number, the gap in this gear is intentional, so it's a 16 tooth gear with only 12 teeth. I opted to just try a couple of circles as thats quick and easy to do, then just tweak the point where they overlap. Once happy trim the circles with the inner and outer tooth diameter circles. Sorry about the red lines, they show up much better at higher resolution. 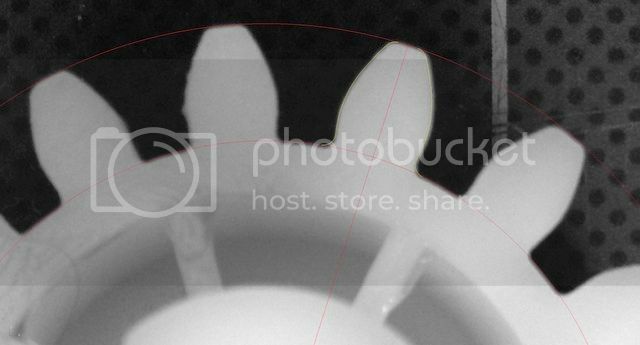 You can really see the parallax error from the photo now and this is why we use CAD generated circles and the profiles are checked against real world measurements. Now we have trimmed and joined our lines we will be able to extrude solids from these curves and use them to join and in the case of the bore, delete a profile to generate our model. We now have a working gear with the boss in this case increased by an extra 1mm radius for strength. As the rack bar is 16mm diameter I make an 18mm section to add as infill to the gears. At this point I had problems with boolean operations so ended up to the cutting and splitting manually. 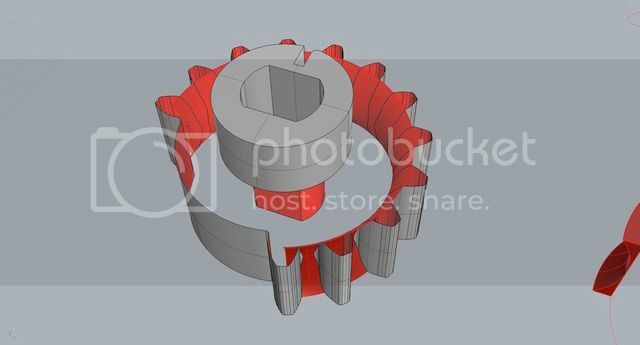 I exploded the gear I just made and removed top and bottom faces and brought in the curved surface to do the cutting of the gears. 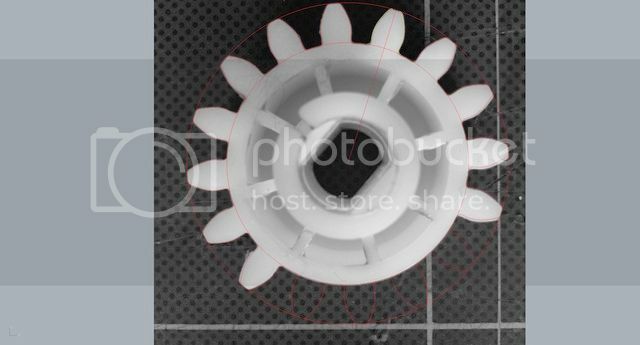 Then its sort of reverse and use the trimmed gears to trim the curved surface to get the finished profile. I'm now ready to add the top and bottom surfaces back to the gear and complete the work. Finished gear and section gear on the left to show the new tooth root profile. All thats left is to export to GrabCad the STL file and it's up for you lot to have a look, try printing or modify the STL file as you wish. Re: Designing Pete's Dremel Gear. 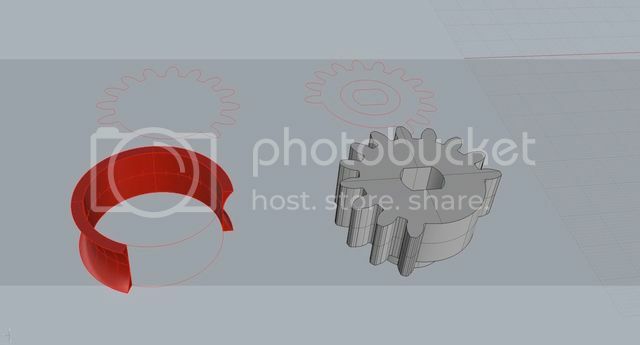 Suggested print settings are 0.1mm layers, 3 walls, 4 solid layers top and bottom and 45% infill. Those would be my starters considering the application here. Better add, I use 20% overlap of filament to get a good bond. Well there you go. Now others will see why its over my head Thanks Joules I'll print it out and let you all know how it goes. I've added a MKII version of the gear. I printed the first one and tried it, the increase in boss size means it tightened on the spring too quickly. The MKII has been printed and tested, and works much better. 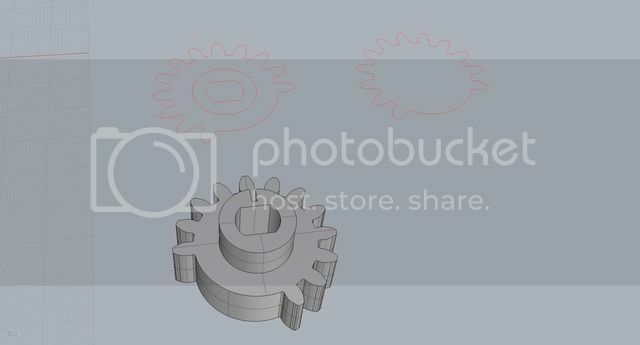 Update added to Grabcad. Joules Thanks for the Mk 2. I think I know why mine fit whereas yours was binding a little. 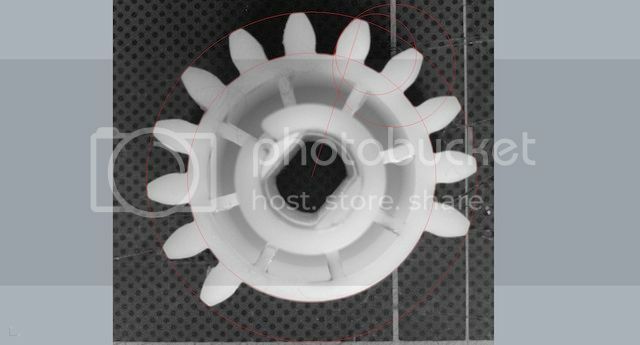 I printed in ABS which shrinks a little and probably makes the difference. An example to this is when I printed the case for my Raspberry Pi 2B I needed to print at 102% as the drawing was for PLA and the board was a little too tight to slide in...at 102% fit was perfect. That comment explains it all as the gear is the same but the shaft appears different on all the models as I had to make a new shaft to fit this gear. My gear was a threaded shaft with a nut in the gear where as your version was pressed on to a shaft with 2 flats for the gear. Photo added to show the gear and the hacksaw mod to the shaft. Cheers Pete, that information is very welcome, I was wondering how the gear worked for you. I have the newer drill stand I guess as the internals are different. At least they use the same gear and spacing. Do you have any software to modify my STL file. 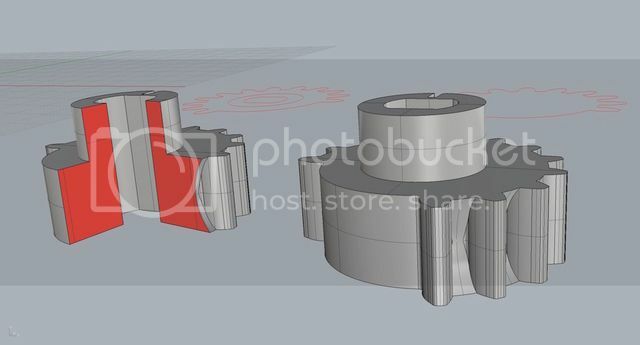 That would be a good start in CAD just tinkering with existing models, like reducing the boss diameter or modifying the spring slot. It's all part of the 3D printing learning curve, so your gear was a useful challenge. Yep I have sketchfab (free version) so I'll give it a go later.